Leeds’ place at the cutting edge of cancer care is the subject of a new book celebrating 50 years of radiotherapy in the city. 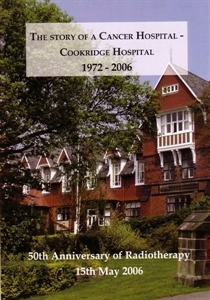 The Story of a Cancer Hospital, penned by Sue Griffiths, professional head of radiotherapy at Cookridge Hospital, (with input from a project team and photographs provided by Jane Garrud, Medical Illustrator) tells the story of how radiotherapy has evolved since it was first pioneered in the 1950s. An earlier volume looking at the history of the Cookridge Hospital from its construction to the 1970s is available on CD to buy from this site. Copies of the book and the CD are also available to buy at the hospital. All proceeds from sales will go to the Cookridge Charity Appeal Fund.